“My God, at last I finished this poor little mass. Did I compose sacred music or damned music? I was born for comic opera, you know it! little knowledge and feeling: that is all. So, be blessed, and grant me the paradise”. Rossini finished with these words his Petite Messe Solemnelle “composed during my holiday in Passy” in two months, in the summer of 1863. He was seventy-one and his conversations with Eternal, full of irony, devotion and fear were more and more frequent. The Messe is not an ordered work nor is addressed to a large audience; on the contrary has a chamber music structure, with the intimate and confidential quality of him who goes to confession with few reliable friends. The discrepancy of the title (Petite and Solemnelle) is seeming: this mass is solemn because it uses the complete liturgical text, it has the soli-choir structure and is widely worked out; it is little, because does not need many performers. Besides the so called ordinarium of the Catholic Church we find a “Religious prelude” (an instrumental section to be performed with the piano or with the harmonium during the offertory, where we can notice the influence of Bach’s style) and the motet “O salutaris hostia” for the soprano voice, between Sanctus and Agnus Dei. Apart from this aria, each voice (soprano, alto, tenor and bass) has a solo in the liturgical sequence; in the Gloria we find two episodes with more soloists together, they are a trio for alto, tenor and bass and a duet for soprano and alto. 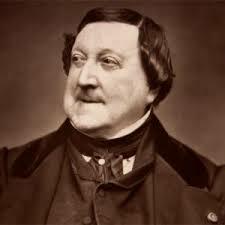 Here we can see the deep and intense relation Rossini had with the piano in his last years (contrary to the ironical way Rossini defined himself as a “fourth class pianist”): in fact in the Petite Messe Solemnelle this instrument has an evident primary part.